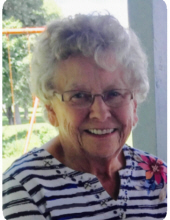 Mary Catherine “Katie” Nuck, 93, of Monroe, died Tuesday, January 29, 2019, at Ohio Living Mt. Pleasant. She was born in Somerset, Ohio on June 20, 1925 to parents William and Florence (Gallin) Flautt. Katie taught at St. John XXIII School. Mrs. Nuck is survived by her son, John (Lisa Pennington) Nuck; daughters, Barbara (Drew McAvoy) Nuck & Martha (Mark) Shaker; grandchildren, Emily (Craig) Planton, Charlie Nuck & Sophia Shaker; great grandchild, Rownan Planton; and special nieces, Catherine Bever & Louise Redden. She was preceded in death by her husband, Gordon Nuck; parents; brothers, George Flautt, Thomas Flautt & Robert Flautt; and sisters, Sara Bever & Isabel Betts. Mass of Christian Burial will be held Saturday, February 2, 2019 at 2:00 pm at Holy Family Parish - Holy Trinity Church, 201 Clark Street, Middletown with Father John Civille as celebrant. Visitation will be one hour prior to the service from 1:00 - 2:00 pm at the church. Additional Service information for Somerset Ohio. There will be a second Mass of Christian Burial on Tuesday February 5, 2019 at 11:00 am at Holy Trinity Catholic Church 228 S Columbus St, Somerset, OH, 43783, with visitation from 10:00 to 11:00 am at the church. Interment will follow in the Holy Trinity Church Cemetery (Somerset, Ohio). Memorial donations may be made to St. John XXIII School, 3806 Manchester Rd., Middletown, Ohio 45042 – OR - Holy Trinity Catholic Church Building Fund, P.O. Box 190, Somerset, Ohio 43783. To send flowers or a remembrance gift to the family of Mary Catherine "Katie" Nuck, please visit our Tribute Store. "Email Address" would like to share the life celebration of Mary Catherine "Katie" Nuck. Click on the "link" to go to share a favorite memory or leave a condolence message for the family.